The Acebil P-20MX Professional Tripod System includes the T750 Aluminum Tripod, H20 Fluid Head, MS-3 Mid-level Spreader, and the S-50 Carry Case. 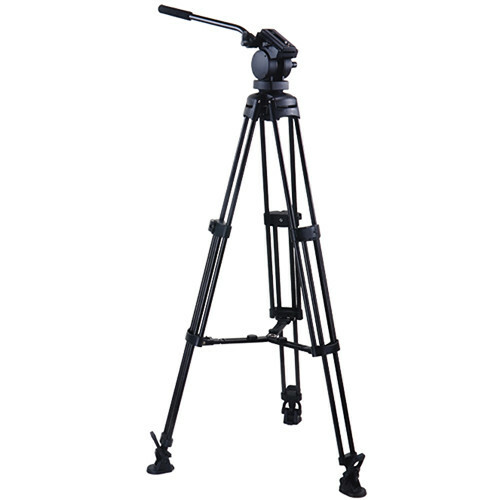 Capable of supporting up to 13.2 lb (6 kg), the P-20MX provides a professional tripod system solution. The T750 can be adjusted to provide a height ranging from 26.4-56.7". Operation on flat surfaces is rendered possible via the MS-3 Mid-level Spreader that holds the legs in position. You can achieve fixed counter balance, pan, and tilt drag by means of the included H20 Fluid Head. A convenient 75mm standard leveling base is also provided allowing tilt angles of +90° / -80°. You can leverage the slide range of ±35mm to enable travel capabilities essential in balancing uneven configurations. Camera mounting is provided via a side plate. You can use the S50 Soft Carry Case for storing the P-20MX Tripod System. Includes T750 Aluminum Tripod that can be adjusted to provide a height ranging from 26.4-56.7"
Box Dimensions (LxWxH) 46.0 x 9.0 x 9.0"